Brown’s Center for Old World Archaeology and Art will host “Qumran: The Site of the Dead Sea Scrolls” on Nov. 17-19, 2002. This is the first international conference on the Qumran community, and it will bring together some of the world’s leading archaeological scholars to consider the many unanswered questions about the settlement. PROVIDENCE, R.I. — It was in the caves of Qumran in 1947 that two Bedouin shepherd boys discovered the Dead Sea Scrolls. While the mysteries of the scrolls have been largely resolved, numerous mysteries surrounding the settlement of Qumran remain. A group of the world’s leading archaeological scholars will gather at Brown University Nov. 17-19, 2002, to examine those unanswered questions. The Center for Old World Archaeology and Art will host “Qumran: The Site of the Dead Sea Scrolls,” the first international conference on the settlement. A conference schedule is attached. The conference will focus squarely on the archaeology of the site – the settlement and surrounding caves, the regional setting of the ruins, architectural features and small finds. Galor believes the work of the participating scholars will provide a fundamental base for future research. Until now, she notes, scholarly controversies and cultural and political differences have resulted in a lack of communication between the Israeli, American and European archaeologists and those from the Ecole Biblique et Archéologique Française de Jérusalem, the school that led the first major excavations of Qumran in the 1950s. 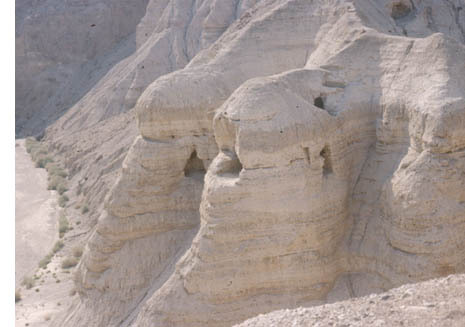 Father Roland DeVaux, the Dominican priest who led the original Ecole Biblique excavation, concluded Qumran was a self-contained monastic settlement of Essenes, the strict Jewish sect that wrote the Dead Sea Scrolls. DeVaux published a preliminary report on his findings, but he died in 1971 without completing his final report. Much of the scholarship on the scrolls and Qumran has been based on that preliminary report, according to Galor, yet some evidence contradicts the priest’s findings. Subsequent Qumran scholars have argued the building complex was inadequate for a religious community; some believe Qumran was the site of a manor house, military fort or commercial storage and distribution center. Qumran also included a cemetery, but there is no agreement on how many people were buried there or whether the dead included both males and females – a detail that could support or contradict DeVaux’s conclusions on the Essenes. Galor will present her own research on the stepped and plastered pools unearthed by DeVaux. 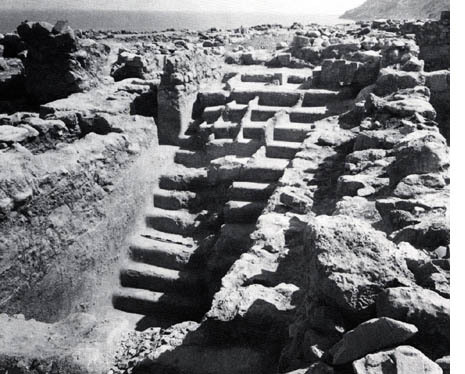 Delineating which of these were religious ritual pools and which were used for water storage may help determine whether Qumran could indeed have been an Essene settlement. Galor will be joined by a host of speakers from around the world, including DeVaux’s successor at the Ecole Biblique, Father Jean Baptist Humbert, who has collected DeVaux’s field notes and is about to publish a final report on his work. “This is an excellent opportunity for the academic and non-academic communities to hear an array of leading international scholars in the field,” said Galor. The conference has been funded in part by grants from the National Endowment for the Humanities, the Rhode Island Committee for the Humanities, Shelby White and Leon Levy, and the Brown Faculty Lectureship Fund. It is co-sponsored by the Ecole Biblique et Archéologique Française de Jérusalem and various departments at Brown. For more information, call (401) 863-2742, visit the Web site, or e-mail [email protected]. Sessions are free and open to the public; registration is required. Joan E. Taylor, Waikato University, New Zealand/University of London, U.K.
Qumran’s Plastered Installations: Cisterns or Immersion Pools? Was There Agriculture at Qumran? Konstantinos D. Politis, British Museum, U.K.
Richard Hoptroff and Edward J. Rhodes, University of Oxford, U.K.